This article discusses about micromax canvas 2 A110 mobile phone. In this article, you would know its price, specification and reviews of the customers. Let's look at the reviews on >review of Micromax canvas 2 A110. This is a very impressive phone from Micromax. Those who are fond of big screen phone will like this phone as it has a screen of five inches. Hope you will like this unboxing and if you have any type of queries about this phone, please drop a suggestion below. As we know the glamour of the product does attract a huge number of buyers, Micromax A110 canvas 2 doesn't discount on its beauty and looks more pleasant than Samsung, HTC, etc. The designing team of Micromax must be appreciated for designing this phone. It's available in White and Black. Dimensions of Micromax A110 are 76.5x147x9.7mm. It's thickness with 9.7mm to fit easily into your pocket. To its front end, there are light sensors. 5 inch screen of this phone covers the most part of the phone. There is a front facing camera for video calling. There's a small LED light to indicate a new mail coming in or any other notifications. To its one side, there are volume rocker keys, towards upside, there's a power button, music jack etc. At the back of the phone, there is a camera and Micromax logo with speaker at back. Phone works on Android Ice cream Sandwich version 4.04. Any smartphone without a powerful processor is like a box. Micromax A110 Canvas 2 is really fast with 1 Ghz processor. This processor is a dual core processor and guarantees simultaneous downloading, video calling without any issues. For instance, I ran three applications like video calling, downloading and file transfer simultaneously in this phone and they worked fine. It shows the efficiency of its processor which is assisted by 512 RAM. High end graphics game runs well in it. This phone's camera feature is commendable. 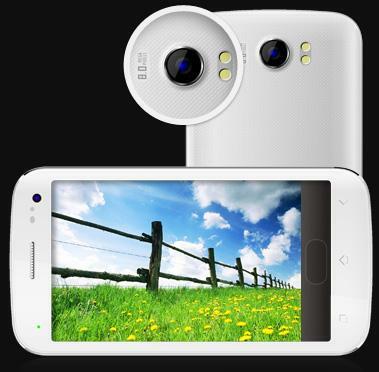 It has an 8 megapixel camera with LED flash light, auto focus, face detection and Geo tagging (an added feature). Camera quality is good enough with a front camera of .3 megapixels for video calling. Video calling works well with high internet speed. Camera comes with a facility of zooming 4X but please keep in mind that afer zooming completely, images tend to get blurred. It works fine during day time. Also Check Out: Micromax Yu Yunique - Really unique or an also-ran? Since Micromax canvas 2 A110 comes in the category of being 'Phablet', screen size is also very big. You have 5 inch, multi touch capacitive screen. This has 16 million color, 854X480 pixel and FWVGA (Full Wide video graphic array) screen; plays 720 Pixels video smoothly without any issues. To protect screen, Micromax has fitted Soda line screen protector to make sure that your screen is not subjected to any type of scratches. There are three dedicated keys at bottom to navigate the phone; in case you are not using the touch of the phone. Now, comes the storage part of the phone. It has an internal memory of 2 GB good for running applications, games etc., with an external memory of an option of inserting a memory card of up to 32 GB that needs to be bought separately by teh users. Coming to battery backup, I would like to say it's indeed a challenge with every smartphone. Poor battery backup doesn't mean that battery provided by the company is bad but the screen of the phone consumes more power. In Micromax canvas 2 A110, the battery is of 2000 Mah and it gives battery back up of up to 1 day even if you watch video, play games and surf internet which shows its battery is comparatively better. Mircomax canvas 2 A110 impressed me a lot with its battery and I can say that this is a Smartphone with good battery backup. After reviewing this phone, I realized that it provides some of the features of Samsung, Nokia etc. Now comes the main part, what is the price of Micromax canvas 2 A110? This is a quite economical Smartphone. You can buy this phone ranging from Rs 9999 to Rs 11000 on various online shopping sites. So in my view, the price is worth looking at its advanced features. I understand peoples' view that it's difficult to trust Indian brands, but Micromax proves it wrong and has gained lots of reputation in the market. They have a smart R&D centre and they are making smartphones of high range available to common people at low cost. Please fee free to write for any questions, suggestions, reviews, etc., by using the "drop a reply" button below. Micromax A110 Canvas 2 full phone specifications, features and online price in India are given here. Micromax A110 Canvas 2 is the successor of A100 Canvas smartphone which was marketed as the first 5 inch phablet. The device which is currently available at snapdeal has already been raved with positive user reviews. Coming under the price tag of Rs 10,000 the A110 will be a competitor to other devices including Samsung Galaxy S Duos S7562, Karbonn A21 and iBall Andi 4.5h. Are you looking for the latest smartphone Micromax A111 Canvas Doodle from the Micromax? Your search for the phone will end now! Micromax has launched and released Micromax A111 Canvas Doodle smartphone with stylus in the market at a price of Rs 12,999 only. You can now draw and doodle anything on this smartphone. Read this article to know the features, specifications, review, price and availability of Micromax A111 in India. Are you looking for a Micromax Canvas Music A88 manufactured to meet the specific needs of music lovers? Your search ends here, since Micromax has released its Canvas Music A88 smartphone at an affordable price of Rs.8,499/-. The smartphone is not only special for music lovers, but also performs all other functions of a smartphone. Read this article to know features, specifications, review, price and availability in India of Micromax A88 Canvas Music. You can download over 3 lakh songs for free. Micromax has recently released another canvas series smartphone named as Canvas Turbo A250. This smartphone is the very first full HD smartphone from the Micromax brand. The phone features a 1.5 GHz MediaTek quad-core processor and 2 GB RAM. Read the below article to know more about the phone. I have been using Micromax Canvas 2 A110 for the last 8 months and it is really an outstanding product. The main feature I like is its big screen and quality camera. The battery life is amazing and I strongly recommend this product to the viewers.